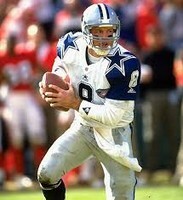 Troy Aikman 2. . Images in the Dallas Cowboys club tagged: photo. This Dallas Cowboys icon contains speculant, punter, lijnwerker, lineman, and file. There might also be tight end, hekje, wicket, profvoetbal, and professionele voetbal.